I've spent a lot of time singing the praises of Levain Bakery back in NYC. They pretty much the most fantabulous, GIANT, cookies ever. They're sturdy on the outside and somewhat underbaked and gooey in the centers. They're pretty much a phenomenon and I miss them like crazy. They have 4 different kinds of cookies- chocolate chip walnut, dark chocolate chocolate chip, oatmeal raisin, and dark chocolate peanut butter chip. I've tried all of them except the oatmeal raisin (because...I mean...it seems like the real wrong choice of the 4 if you ask me). My favorite is the chocolate chip walnut--which I've already posted a copycat for. 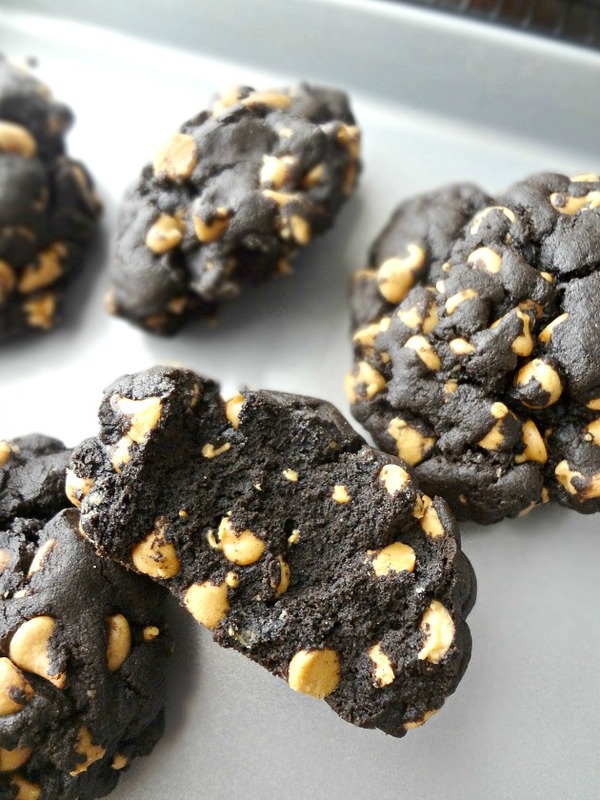 And today I'm posting a copycat recipe for my 2nd fave: dark chocolate peanut butter chip....MMMMmmmmmm! The cookies are big. Like...beyond big. Like full-on GIANT. Because that's part of what makes Levain style cookies so amazing-they're huge and almost biscuit like on the outside, but gooey and slightly underbaked inside. And these ones are SO SO SO RICH. 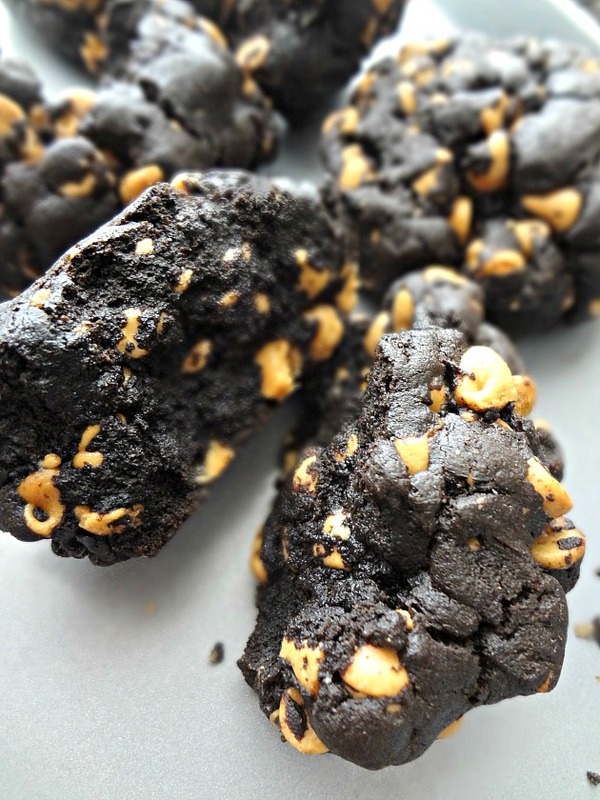 Super chocolatey, with lots and lots of gooey peanut butter chips. If you're the kind of person who drinks milk...you're gonna want a big glass. I, personally, just bask in the decadence. These are a show stopper my friends, not for the faint of heart! Whisk the flours, cocoa, baking powder, baking soda, and salt together. Using the paddle attachment on a stand mixer, cream the butter with the sugars until combined and fluffy. Beat in the eggs, scraping the sides of the bowl as needed. A little at a time (I usually do it in thirds) add in the dry ingredients and mix on low until combined. Pressing the dough together, measure out 8 equal sized balls of dough (they should each weigh between 5 and 6 oz.) 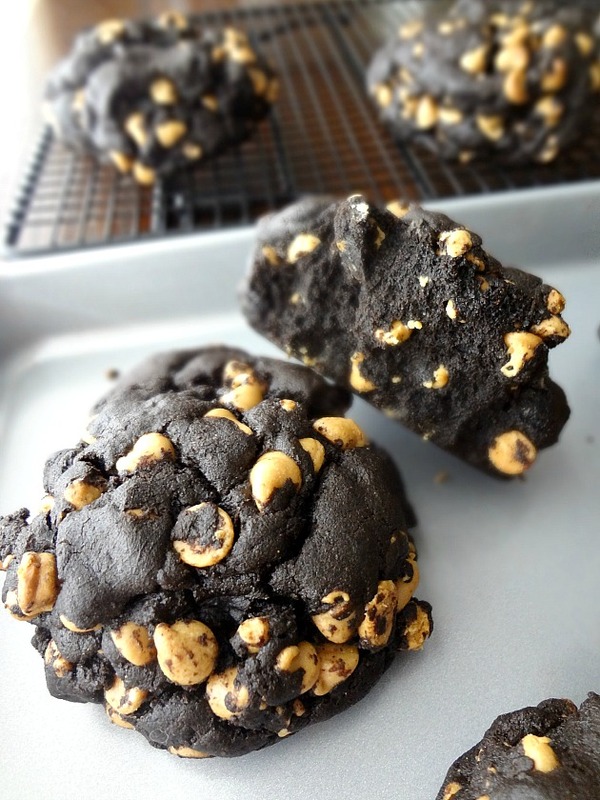 Place on a large, parchment paper-lined cookie sheet (leave plenty of room in between--if needed, divide the cookie balls between 2 baking sheets). Break each portion in half, pressing the smooth sides together well and leaving the rough edges exposed. Cover with plastic wrap and freeze for 1-2 hours. Place one oven rack in the center of the oven and one on the bottom rack. Put a cookie sheet on the bottom rack. Preheat oven to 375F degrees. Place the parchment lined cookie sheet on the center rack, while pouring a cup-full of ice on the sheet on the bottom rack. Quickly close the door to trap the steam. Bake the cookies for 18-22 minutes, or until the tops of the cookies feel done, but the insides are still soft. Remove from the oven and let the cookies cool on the sheet for 10 minutes, before transferring to a rack to cool completely. Serve warm. Store leftovers in an airtight container at room temperature. For room temperature cookies: heat in the microwave for 10-15 seconds, if desired. Melty peanut butter chips for the WIIIIN.